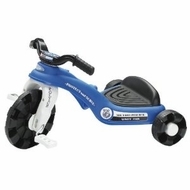 Have your kids patrolling your property in time using this awesome police cruiser mini tricycle. This mini trike is perfect as your child first cruiser as it is pedal powered and perfect for ages 1.5-4 ages. Measures 24" x 16 3/4" x 14 1/2"